The presented case involves a 68-year old woman with a blank medical history despite chronic back complaints. For this she was put on pain-killers. After the first dose she developed a severe allergic reaction for which intramuscular adrenaline was administered. Shortly afterwards she complained of chest discomfort. 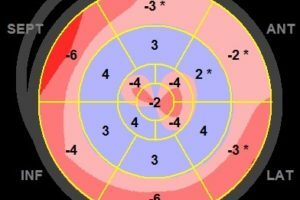 The ECG on the emergency room showed T-wave inversion in the inferolateral leads with subtle ST segment elevations in the inferior leads. The laboratory results showed an elevated troponin. Due to ongoing complaints, an emergency angiography was preformed which showed completely normal coronary arteries with no stenosis. 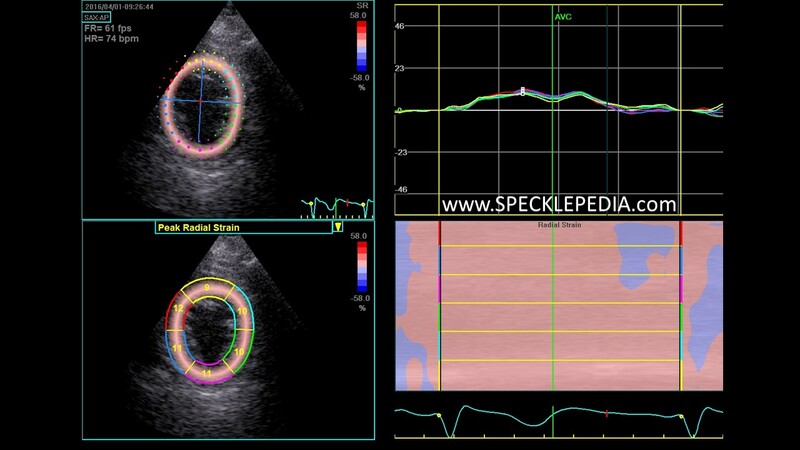 An cardiac ultrasound was made subsequently which showed typical findings for a Tako Tsubo cardiomyopathy. 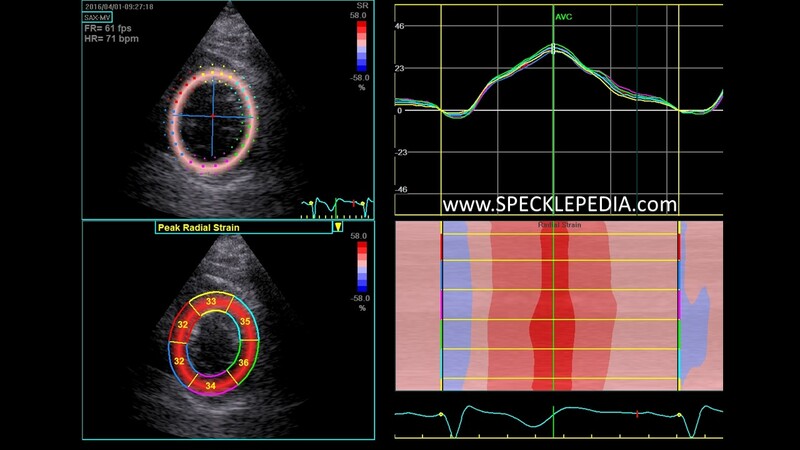 LV systolic function was decreased with an LVEF of 45% with typical wall motion abnormalities: akinesia of the apex and hypercontractility of the basal segments. This can also be appreciated on the 3D reconstruction (9-slices and volumetric reconstruction). 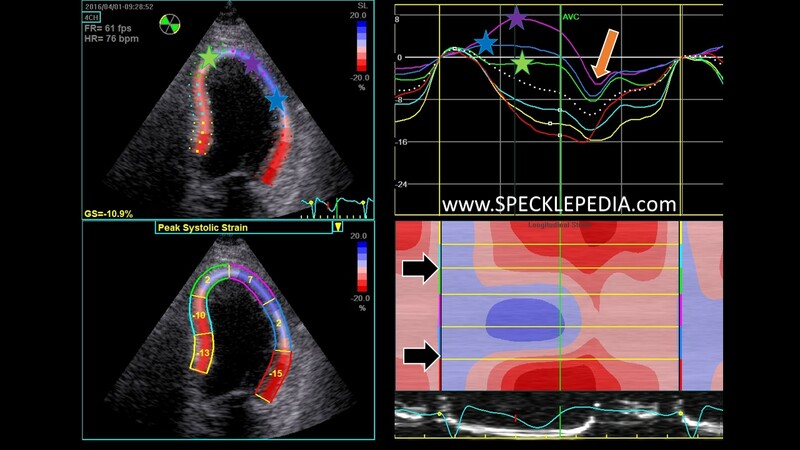 Deformation imaging showed clear abnormalities in the apex and also the midventricular segments: no longitudinal systolic deformation and even some systolic stretching. 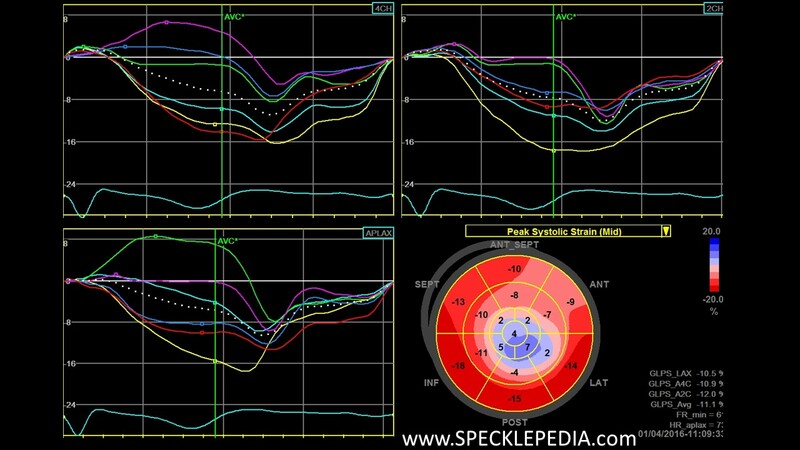 This is accompanied with pronounced (extreme) post systolic shortening in these segments, even extending to the segments with normal peak systolic strain values. 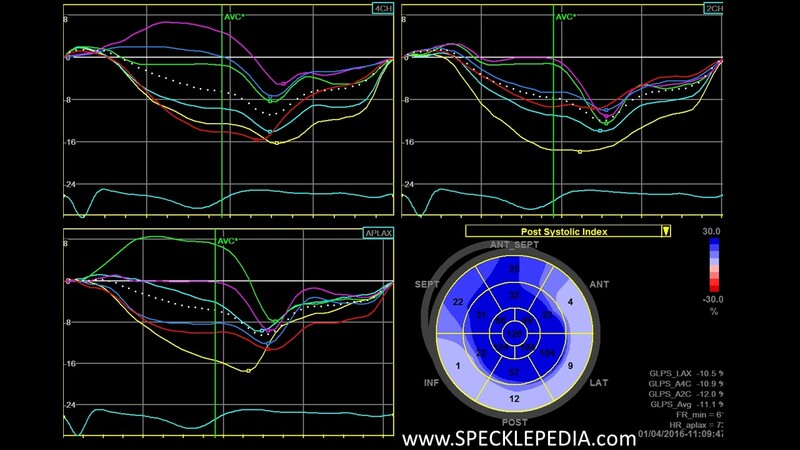 Short axis views show the radial strain at the apical level (only 10 %) and the preserved radial strain in the basal level (35%). 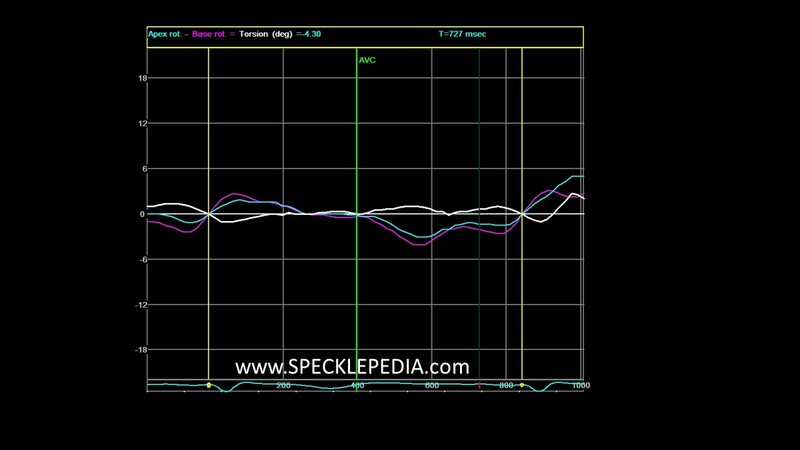 Analysis of the rotation and torsion reveals an absence of torsion in this disorder (indicated by the white line) due to synchronous rotation of the entire left ventricle in a clockwise direction. 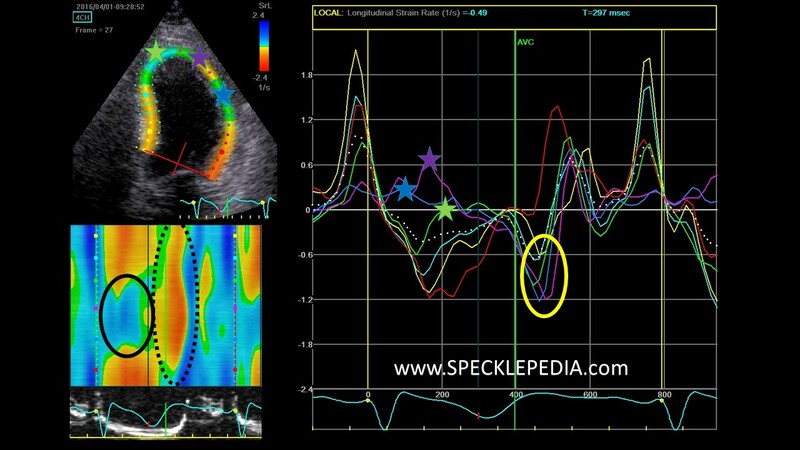 After almost 2 weeks of follow up the ultrasound was repeated, showing complete normalization of LV systolic function and complete disappearance of the wall motion abnormalities. 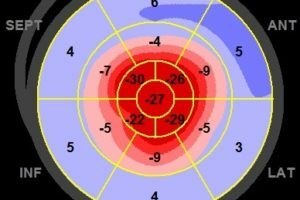 Deformation imaging showed partial normalization of strain values in all affected segments. 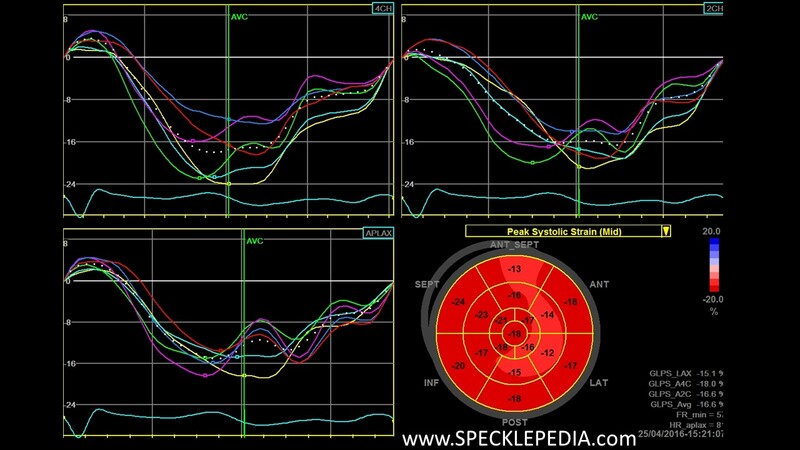 The pronounced post-systolic shortening is still seen. 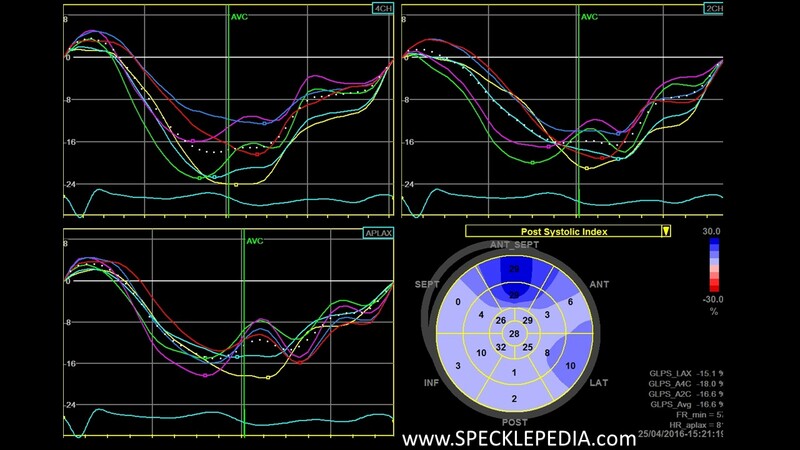 Currently, we do not know if this will completely restore after longer follow up.